Later in 1988, I went to Taiwan again. 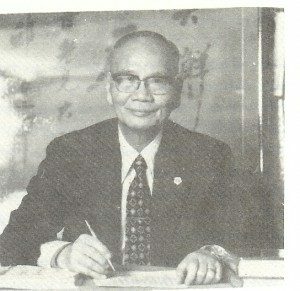 This time I spent most of my time studying with Master Hsu Ting-Ming, who was a famous Chinese Psychic Healing teacher. I studied four hours a day with the great master. I also visited Master Pan, Master Chin, and Master Chiao explaining to them what I was learning. They all knew of Master Hsu Ting-Ming, and said he was the best in psychic healing and it was good that I was learning from him. During the slow season when I didn’t have classes, I would go out and do chi kung acupressure on many Chinese people. Many of them realized that I was better than their own doctors and called upon me if they had something wrong or just wanted an acupressure treatment. One day after working on four clients, I arrived home that evening. My wife informed me that a lady from Mainland China was coming over and requested me to help her. I asked her to change it to another day, as I was very tired. My wife pleaded with me, so I accepted. My wife met her at the door, they talked, and then she introduced her to me. Her name was Ms. Wong. She explained that she had been in an accident three years ago and had great pain under her shoulder blade on the right side ever since. She said she had gone to doctors in China, acupuncturists, and a chi kung doctor. She also went to Taiwan for help and now was here in the U.S. The doctors here wanted to operate on her, as they were not sure what was wrong. I told her I would fix her problem. I laid her on the massage table. My wife was standing close by, watching. I started using acupressure, chi kung, and psychic healing. Then my body started to sweat and a very strange look came over my face, my wife said later. The woman let out a loud scream because the heat from my hands under her shoulder blades was so hot she couldn’t stand it. I was now in a trance and spoke out in a strange and forceful voice, “Shut up.” My wife became afraid, as she had never seen this side of me. After thirty minutes, I told Ms. Wong to get up. To her amazement, for the first time her pain was gone. She offered me money. I refused and told her, “I did not heal you. It was a force more powerful than me.” I was exhausted and soaked with sweat. She continued to talk with my wife after I left quietly and went to bed. The Taoists and many other cultures believe that there is a higher force on this earth. If you are taught by a good teacher and have good values and a kind heart, sometimes you can tap into this higher healing force. They also believe that this force should not be abused and you should not gain riches for something that is not yours. You are only an instrument of this higher power, which is to be used for helping those who are worthy. Free Pages From the Book!